Let’s start with the idea of installing wall paper to the backside of your wall cabinets. Not only does this concept creates a pretty background for the contents of your cupboard, whether that be your everyday cups and glasses or serving pieces saved for special occasions, but it instantly makes the cabinet, and the kitchen feel more considered and custom. This application works if your cabinet doorsare solid, but can really make a statement for all to enjoy if your doors are glass. There are some great removable wallpaper options on the market that would be ideal if you are a renter, or a person that changes their mind often. The ceiling is a great place to make a visual statement in the kitchen. High above the rest of the room, any color, texture or pattern you select will certainly add interest and impact to your space as a whole. Installing wallpaper on the ceiling is a great option for those that are looking to update their space, but don’t have the funds to do a full gut and replace remodel. By making a bold and thoughtful selection with your wallpaper, the eye will be drawn to this application and away from other, more generic items in the space. One – select a paper that is loud and demands attention and then let the other elements in the space become a quite accompaniment. The kitchen pictured here is the perfect example – white cabinets, no backsplash and subtle accessories, allow the wallpaper to take center stage. Two – select a paper that is more understated and quite. Going in this direction will allow the paper to be considered another layer working to add visual interest to the room without overwhelming the other selections. This direction would allow other elements in your space, say the cabinets or countertops to have a bit more personality either in color (cabinets) or movement (countertops). 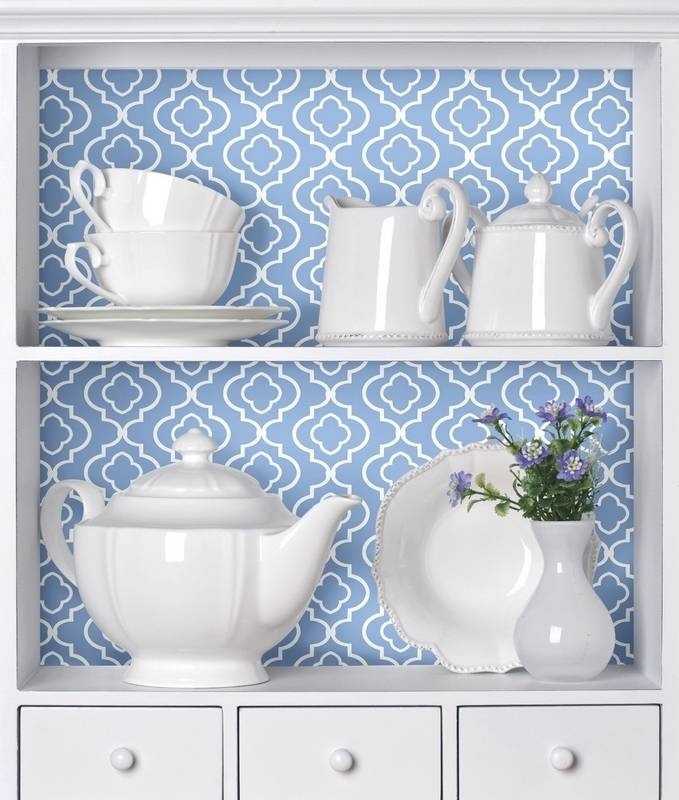 Using wallpaper to line the inside of your drawers is a fun way to add a little unexpected flair to your kitchen cabinets. 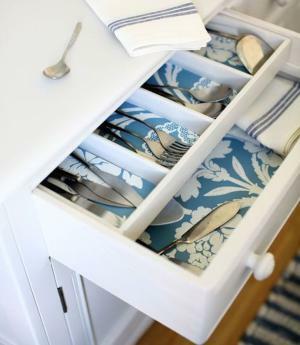 You can line each and every drawer or just a select few; whichever approach you decide on this idea is sure to leave your kitchen feeling a bit more pretty and considered every time you reach for your knives and forks. The backsplash area is typically 18″ to 21″ above the base cabinets in the kitchen and is a great spot to consider adding a little wallpaper. For some, the idea of wallpapering every wall of a room, especially a room as busy as the kitchen, can seem daunting, overwhelming and even expensive. The space between your base and upper cabinets aka the backsplash area provides an ideal amount of space to showcase a wallpaper detail without completely overwhelming the room. 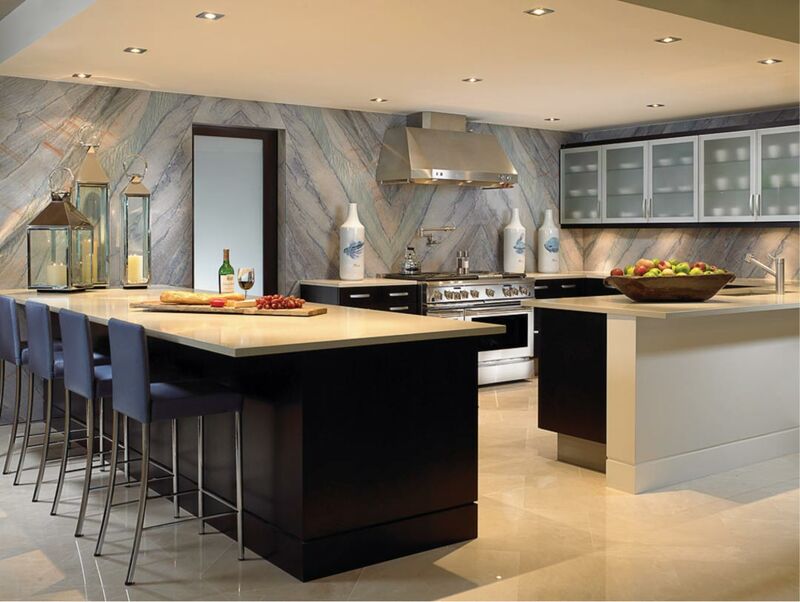 In the image seen here a 3D Backsplash wallpaper was used which gives the illusion of tile. As I said earlier wallpaper comes at many different price points, and even at it’s most expensive it will likely be less than a more traditional backsplash application like tile or marble. The expense coupled with the fact that many wallpapers today are removable makes this another idea worth considering for those who may be renting their current space but still long to make it their own. Wallpaper is definitely a great innovation! You might never heard before that one piece of paper can affect your entire kitchen looks. 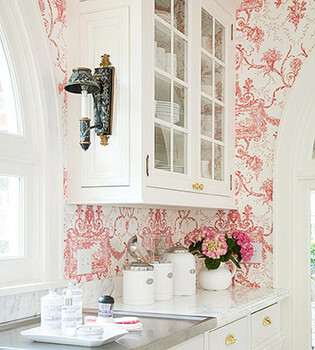 A right wallpaper color and pattern in the right area of the kitchen can really make a huge different. In addition, you can simply find a cheap wallpaper in the market and you can change it anytime when you feel bored of the kitchen pattern. So, what you are waiting for? 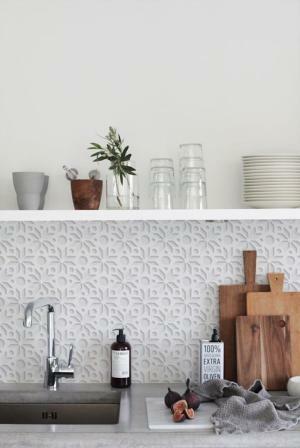 Go quick to buy some wallpapers to transform your kitchen into another level.